How Fast Can Locksmiths Open A Car Door? It is every motorist’s worst nightmare: they are running late for an important meeting at work when the key gets stuck in the door of the car, leaving them locked outside with the rain beating down on their brand-new suit. Or maybe the whole family is just about to set off on the holiday of a lifetime. Sometimes doors on older vehicles can become stuck. Also, the car bonnet might be stuck at important times like a breakdown. Whatever the reason for the car being inaccessible, in a situation like this it is important not to panic and to act as quickly as possible. Action Lock has years of experience in helping people who have accidentally locked themselves out of their vehicle. Locksmiths pride themselves on the speed at which they can do their job, but just how fast can a locksmith unlock a car door? Read on in order to find out more. Action Lock Locksmiths are able to open car doors and bonnets in a non-destructive way which will keep the car intact and will allow motorists to get on with their busy day without having to take the car to a mechanic for costly repairs. Hours of training are conducted in order to make sure that the locksmiths are highly-skilled and keep the condition of the car in mind at all times when they are called out to an emergency like this. How Will The Locksmith Remove The Key? One method to remove a key which is stuck in the lock is to lubricate the key with graphite powder in order to make it easier to slide out of the car without causing extensive damage. The locksmith will need to leave the lubricant to settle for a couple of minutes in order to let it set properly. Once the waiting period is over, then the key can simply be teased out of the lock in no time at all. If the key is stuck fast inside the lock, or it happens to have snapped off and got jammed inside, taking apart the locking mechanism is another simple way to open the car door. This will take the locksmith longer than simply applying lubricant, but the locking mechanism should be dismantled in a short while. The mechanism will then have to be replaced with a new set. Make sure to have a spare key handy in order to start the car and get on with the journey. This is the most time-consuming method for gaining access to a car, but in rare cases, the door may need to be taken off its hinges if the other methods do not work. This is done in order for the locking mechanism to be inspected from the inside of the car. This will allow the locksmith to see whether there has been some internal damage which is preventing the vehicle’s door from being opened. 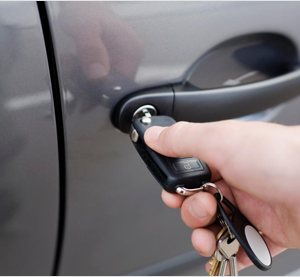 Locked out the car and need an auto locksmith urgently in Perth? Check out our homepage and contact us now! This entry was posted in Auto Locksmith, General Locksmith. Bookmark the permalink.